The wait is over. 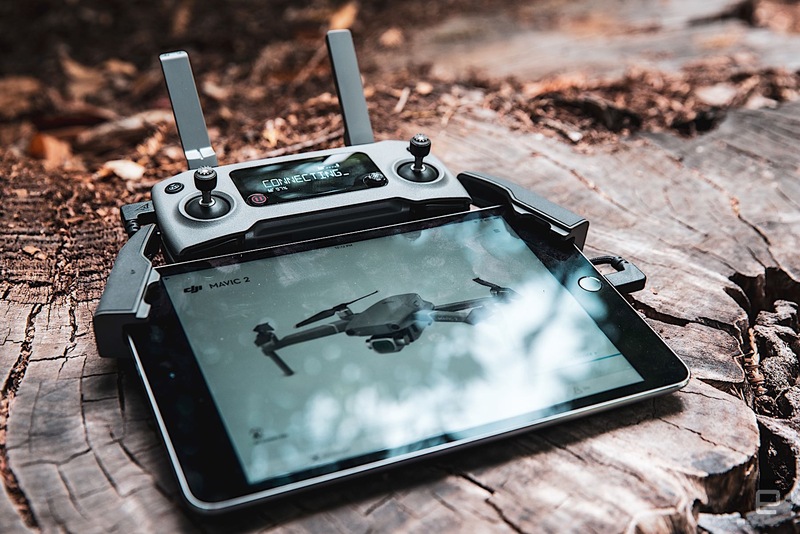 DJI recently announced the sequel to the immensely popular Mavic Pro, and it looks like the new version has almost everything a Mavic fan could want. The new Mavic 2 comes in two variants, the "Pro" -- which features a Hasselblad camera with a 1-inch CMOS sensor -- and a "Zoom" version, which (as you may have guessed) comes with an optical zoom lens mounted in front of a 1/2.3-inch sensor. The Pro and Zoom are identical apart from the cameras and gimbals, and both versions of the Mavic 2 improve on the original Mavic's specs in just about every aspect, from image quality to obstacle avoidance. But all this tech doesn't come cheap. At $1,249 for the Zoom or $1,449 for the Pro model, the Mavic 2 may be too expensive to match the explosive popularity of the original Mavic (which cost just $999 at launch). The DJI Mavic 2 Pro is an outstanding drone, and a worthy successor to the original. The Hasselblad camera turns out stellar images, and makes it a solid option for those looking for Phantom 4-level shots, with Mavic portability. It’s a fair amount more expensive than the previous version, but the value may be even better this time around. However, I wouldn’t recommend the Mavic 2 for everyone. The lack of Wi-Fi connectivity may be a deal-breaker for certain people. If you don’t need all the new features, there are less expensive drones with similar designs and capabilities, but none of which are as robust and comprehensive as the Mavic 2 Pro. 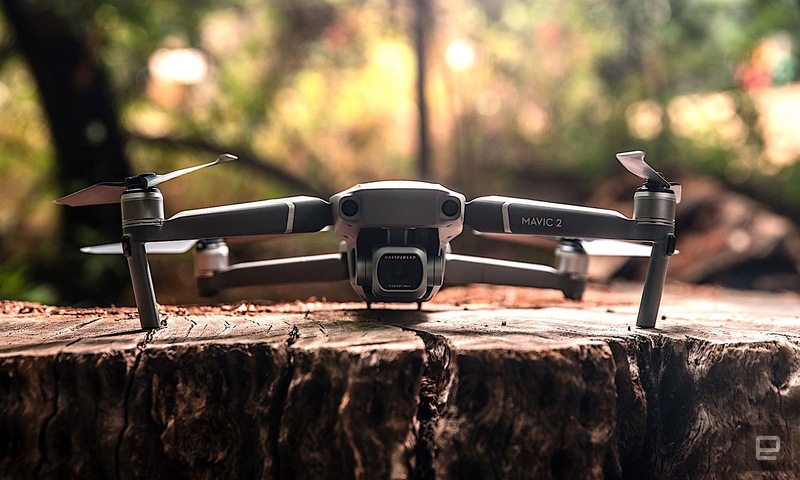 Be the first to review the Mavic 2 Pro? The DJI Mavic 2 Zoom may not have quite the same image quality as the Pro, but the zoom lens makes it a blast to fly and it has some interesting features that aren’t available on the Pro. It’s also less expensive than the Pro, but not by much. It’s still a significant upgrade from the older Mavic models, but if you don’t need all the new features and performance improvements (or if you need WiFi) you may want to take a look at the much less expensive Mavic Air instead. Be the first to review the Mavic 2 Zoom? Let's start with what the Mavic 2 Pro and Mavic 2 Zoom have in common, which is basically everything except the camera and gimbal. The first thing you'll notice about the Mavic 2 is that looks a lot like the Mavic Pro. 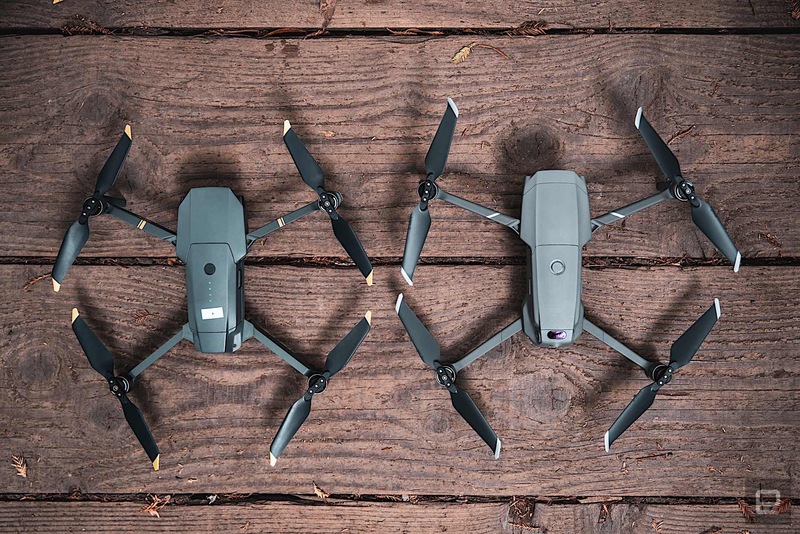 It has the same angular aesthetic, and it's roughly the same shade of battleship gray, though the Mavic 2 is a just a smidge bigger than the original. A quick look at the Mavic 2 cameras tells you all you need to know, though. The Mavic 2 Pro's shooter has the Hasselblad logo emblazoned on the front of its chunky silver housing, while the Mavic 2 Zoom's looks more like a beefed-up version of the camera found on the Mavic Air. For my primary job as a photographer, I use the Phantom 4 Pro V2. While the P4 is a great drone that produces gorgeous images, I'm having so much more fun with the Mavic 2. Not only is the Mavic more portable than the Phantom, it's less conspicuous. The loud, bulky -- some might even say "smurfy" -- design of the Phantom series invites a lot of unwanted attention when flying in public. With the Mavic, once it's in the air, I just look like I'm engrossed in a video game on my mobile device. The Mavic 2 isn't just stealthy; it's also a joy to fly. Flight-time and performance see modest improvements over the Mavic Pro; the Mavic 2 has a top speed of 44 miles per hour (in sport mode) and maximum flight time of 31 minutes (with no wind). It's not a huge upgrade from the Mavic Pro's 40 MPH top speed and 27-minute battery life, but it does feel a bit nimbler in the air, and four more minutes of flight-time can sometimes make the difference between getting a great shot and missing it. Obstacle avoidance gets a massive upgrade, too. The Mavic Pro could only detect obstacles below or in front of the drone. The Mavic 2 has sensors on the front, back, top, bottom, left and right. I won't say the drone is uncrashable, because I'm sure somebody will find a way to do it, but it's close. I try not to rely on the obstacle avoidance system too much when I'm flying, but watching the Mavic 2 stop itself dead in its tracks just as it was about run into a tree (more times than I'd like to admit) gave me the confidence to fly closer to obstacles than I would have dared with the Mavic Pro. However, it should be noted that the left and right sensors currently only work in ActiveTrack and Tripod modes. So, if you're in any of the other flight modes, you can still stray into an obstacle to the left or right of the drone. As before, obstacle avoidance is disabled in sport mode. The Mavic 2 also has 8GB of onboard storage, but it fills up quickly -- so you'll want to invest in a larger micro-SD card to store your photos and videos. Be sure to check DJI's list of supported SD cards, as I encountered glitchy video when recording on an older card. As for the Mavic 2's controller, it fuses the ones that came with the Mavic Pro and Mavic Air. It has the removable thumb-sticks that stow away inside the arms like the Mavic Air controller, but also has the built-in LED readout like the Mavic Pro's. My only gripe is that I wish DJI would add more physical controls to the RC for manual exposure settings like you'd find on a DSLR. Having separate hardware dials for ISO, shutter speed and aperture would really speed things up when adjusting exposure in flight. There are assignable controls, but they don't suit everything. Another welcome upgrade is DJI's new video transmission system. Occusync 2.0 gives the Mavic 2 a whopping 5-mile range with a 1080p live feed to your mobile device. This means the Mavic 2 can fly farther and show you what you're shooting more clearly than ever. I was surprised at how drastic an improvement this really is, especially when flying in urban areas where the older Mavics and Phantoms can struggle to maintain a connection (due to radio interference). The bad news is that the Mavic 2 does not have Wi-Fi, so you won't be able to control it using only your mobile device (as you can with the original). This may not matter to most but could be a deal-breaker for some. I'm thinking of action sports enthusiasts who don't want to carry a controller while snowboarding or (or whatever). If you need a drone that you can launch and control with just your phone, then, the Mavic 2 isn't for you. For the rest of us, there's one more bit of good news. The Mavic 2 connects to GPS faster and more reliably than any DJI drone I've tried, even when surrounded by tall buildings or trees. This is not a feature that DJI is touting, but it is a welcome improvement. There are some notable upgrades in the latest version of DJI's Go 4 app as well as the brains of the Mavic 2 itself. However, certain flight modes that have been around since the Mavic Pro are conspicuously absent (more on this later). Active Pilot Assistance System (APAS) was introduced on the Mavic Air, and I'm happy to see that it's made its way to the Mavic 2 as well. Activating APAS (easily accessible with one tap in the DJI Go 4 app) allows the Mavic 2 to fly around obstacles when moving forward or backward automatically. I tested this in a redwood forest with mixed results. Usually, the Mavic 2 would find its way around the trees, but it would occasionally get stuck and stop moving. It would be nice if APAS was a little smarter about picking a path, but on the bright side, I couldn't get the Mavic 2 to fly into a tree with APAS activated either. The Mavic 2 has a few new tricks beyond improved APAS, but it's also worth noting some important features that are missing. At the time of this review, the Mavic 2 does not support CourseLock, HomeLock or Terrain Follow. All these flight modes are available on the 2-year-old Mavic Pro, so it's strange to find them missing on the Mavic 2. DJI may add some or all of these flight modes in a future update, but they aren't available now. Fortunately, ActiveTrack (select a person or object for the drone to follow and keep in frame automatically) remains, and has improved -- but it's still far from perfect. I tested the feature at Oakland's Lake Merritt, where I attempted to track a variety of moving subjects. ActiveTrack works great on large subjects moving at a steady pace, but it was unable to track smaller subjects or anything that changes direction suddenly. I managed some nice shots with the Mavic 2 tracking boats and cyclists, but when I tried to select a bird floating in the lake it stubbornly refused to lock on, and it even lost track of a jogger at one point. Another new touch is that you can select a Point of Interest by drawing a box around it on the screen of your mobile device. 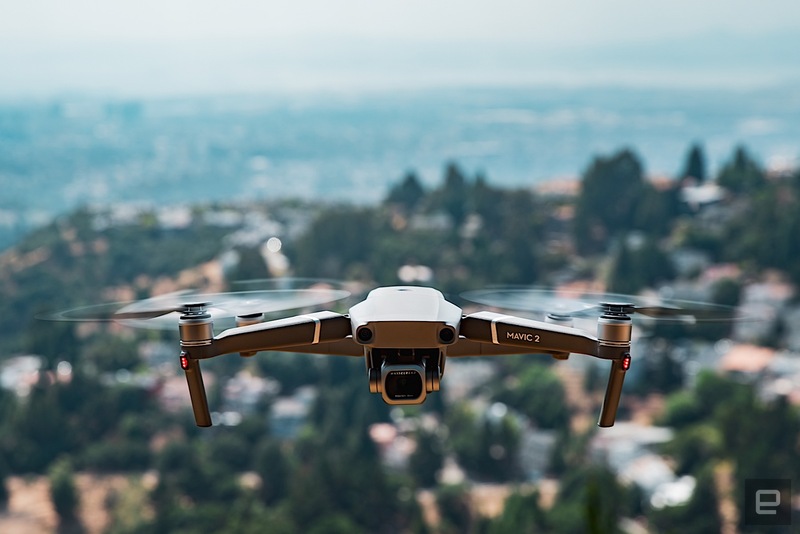 Once select, the Mavic 2 uses its forward vision system and GPS to calculate the distance to the subject and begins to orbit it automatically. I was initially skeptical about this feature, but it worked perfectly every time. This saves a lot of time over the old way (flying directly over the thing you want to circle and setting the object's location manually). You can still select a POI the old way if you prefer. While some flight modes are missing, the Mavic 2 has a brand-new one called hyperlapse, which creates a time-lapse video from a sequence of still images automatically. When you launch hyperlapse mode, you choose between four different ways to move the drone as it shoots: Free, Circle, CourseLock and Waypoint. It's weird that CourseLock and Waypoint are available in hyperlapse mode, but not in normal flight. If you're in Free mode, you can just set the photo interval time and hit "go." Then simply fly the drone while it takes photos at regular intervals. In the other modes, you'll need to select a POI, set a course for the drone to follow, or create waypoints (max. five) for the Mavic 2 to follow as it shoots the hyperlapse. After that, you can literally put the controller down and let the Mavic 2 do its thing. The Mavic 2 will combine the still photos into a 1080p, 25fps timelapse video automatically, but you can also save the original photo sequence in raw or jpeg format if you want to edit it manually later. The downside of hyperlapse mode is that it uses a ton of battery life. Depending on your settings, you'll probably only be able to shoot one or maybe two videos per flight, so you'll need plenty of spare Mavic 2 batteries if you plan to use this feature often. If the camera itself is the important thing for you (and it should be) here's where things get tricky. Both versions of the Mavic 2 are fantastic. If you can afford to buy both the Mavic 2 Pro and Mavic 2 Zoom, then you can stop reading now (and lucky you). Most of us will need to carefully consider the strengths and weaknesses of the two camera systems to decide which one is the best fit. 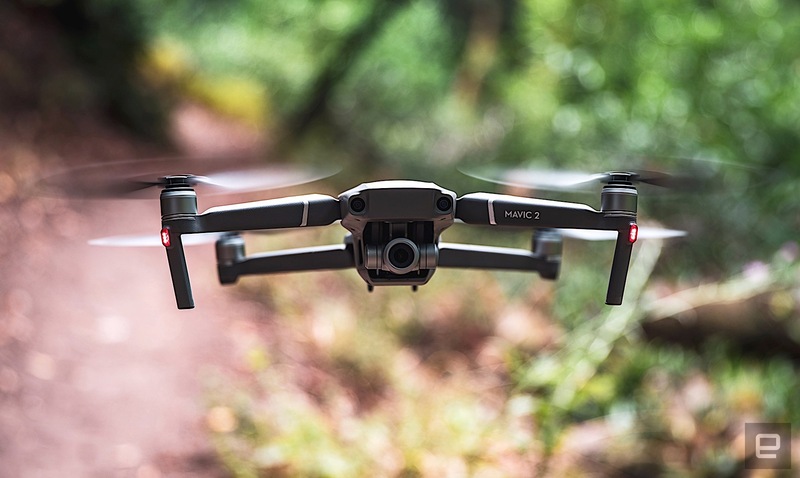 The main selling point of the $1449 Mavic 2 Pro is the 1-inch CMOS camera which DJI says was co-engineered by Hasselblad -- a company best known for professional-grade medium-format cameras. Hasselblad cameras were even used by the Apollo 11 astronauts, so the name carries a certain cachet in photography circles. But does adding a Hasselblad logo on the Mavic 2 Pro represent a real improvement in image quality over DJI's other drone cameras? I don't know how much "co-engineering" Hasselblad actually put into the Mavic 2 Pro, but I can tell you that the image quality is superb and that it's absolutely on par with (and in some ways better than) the larger Phantom 4 Pro. Here's why. This one is huge. A variable aperture allows you to control depth of field and gives you more control over exposure. Until now, the only DJI cameras with adjustable apertures were attached to much larger drones like the Phantom Pro or Inspire series. Having aperture control in a foldable drone like the Mavic 2 Pro is an absolute game changer. This is big too, both literally and figuratively. The size of a camera's sensor determines how much light it collects to capture an image, and the sensor on the Mavic 2 Pro is four times larger than that of the Mavic 2 Zoom. 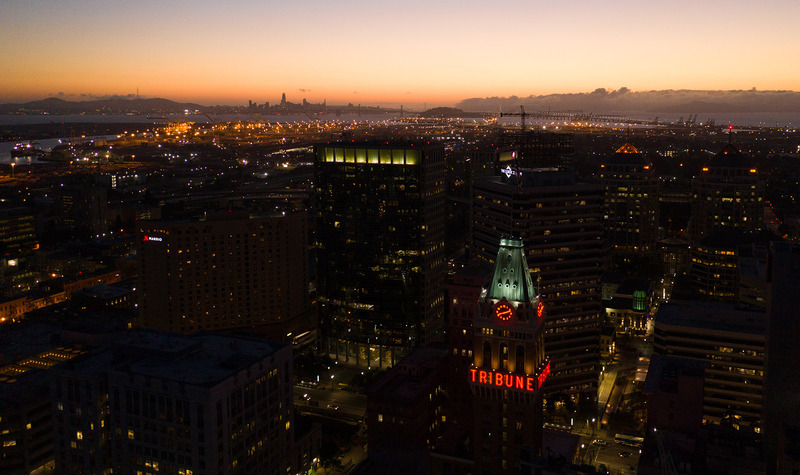 In practical terms, this means the Mavic 2 Pro has more dynamic range and less noise when shooting in low-light. The larger sensor also creates a shallower depth of field, which (along with the adjustable aperture) gives you more control over what's in focus and what's not. The Mavic 2 Pro also shoots 20-megapixel photos vs. the Mavic 2 Zoom's 12 megapixels. More megapixels doesn't always mean better photos, but it does provide more flexibility when cropping your images. However, if you're primarily sharing your photos online, and you don't do a lot of cropping, then you won't see much benefit from the higher resolution. We're starting to get into the weeds here, but if you plan to color-grade your drone footage in post, then you'll appreciate the ability to record video in the 10-bit Dlog-M profile which can record over a billion colors. And if you happen to own a Hybrid Log Gamma (HLG) TV, then you can playback 10-bit HDR videos shot with the Mavic 2 Pro. When I learned there were two versions of the Mavic 2, I assumed I would go for the more expensive Pro version over the (slightly cheaper) Mavic 2 Zoom because image quality, aperture control and low-light performance are extremely important to me. After flying both for a week, I have to admit the Zoom is awfully tempting. The Mavic 2 Zoom is the first ever foldable consumer drone to feature 2x optical zoom. My initial reaction was, "Why not just fly the drone closer to your subject?" But as I started flying the Mavic 2 Zoom, I realized that a zoom lens has the power to change the way you fly and what you choose to shoot. One of the toughest aspects of drone photography is that you can only see what you're capturing on a smartphone or tablet screen. Many times, after returning from the field, I've noticed things on my monitor that I had no idea were there when I took the shot. Once I discovered a flock of birds in what I thought was an empty blue sky. Another time, I found that I had captured a distant ferry-boat in the background of a photo that I had no idea was there when I clicked the shutter. Sometimes these discoveries are happy accidents that add to the scene, but other times I'm not so lucky. Being able to zoom in and inspect every nook and cranny of a scene before shooting gives a much better sense what you're actually shooting. It's also just plain fun to be able to zoom in and check things out while you're in the air, and sometimes you'll discover great shots that you might have otherwise missed. The Mavic 2 Zoom has an additional QuickShot mode you won't find on the Pro called Dolly Zoom. It automatically zooms in on a selected subject while flying backward, creating a visual effect that will look familiar to anyone who's seen Alfred Hitchcock's Vertigo. It's easy to execute while flying, and I'll admit it's a cool trick, but DJI seems to be hyping this as a major selling point for the Mavic 2 Zoom. I have a feeling most Mavic 2 Zoom owners will try Dolly Zoom a few times and then forget about it. Either that or the internet will be flooded with Dolly Zoom videos, and we'll all be sick of them before too long. Either way, it's a fun addition to the QuickShot modes but doesn't seem like a must-have feature. The Zoom has one last trick up its sleeve which allows it to create 48-megapixel images by automatically zooming in, capturing multiple photos and then stitching them together (all within the DJI Go 4 app). That's great, but it's not the same as having a 48-Megapixel camera. If anything moves within the scene while the photos are being taken, you can end up with strange artifacts or visible seams in your final image. If there's nothing moving in your shot (and it's not too windy), it works well. But if you really need a 48-megapixel image, then you're probably better off stitching your images manually rather than letting your phone do it. Fortunately, the app allows you to save the individual images in raw or jpeg format so you can do just that. The Mavic Pro had virtually no real competition when it came out (RIP Karma). Today, there are several foldable drones competing for your dollars, even if many of them are also made by DJI. The $700 Parrot Anafi has some interesting specs, but it lags behind the Mavic 2 in obstacle avoidance and autonomous flight modes. If you need WiFi connectivity, then you'll want to steer clear of the Mavic 2 and choose either the Mavic Air or Mavic Pro (2016). For everyone else, the only real downside of both Mavic 2 models is the price. So, which Mavic 2 should you get? There's no clear winner here. I'll probably end up buying the Pro, but only because it has the features that matter most to me: adjustable aperture, better low-light performance, and higher resolution photos. If those things don't interest you, then you can't go wrong with the Zoom because it's so much fun to fly and you may discover shots you would have missed with the Pro. Also, if you get the Zoom, you'll have an extra $200 to spend on microSD cards so you can record hours and hours of those Dolly Zooms. Stephen Loewinsohn is an Oakland, California native who has been documenting the people and places of the Bay Area as an editorial and commercial photographer for almost a decade. In 2017, he started experimenting with aerial photography using drones and instantly became obsessed with exploring all the fascinating new creative opportunities that go along with having a tiny flying camera.